The A4 is a great Five Star car alarm packed full of good features and all at an affordable price. 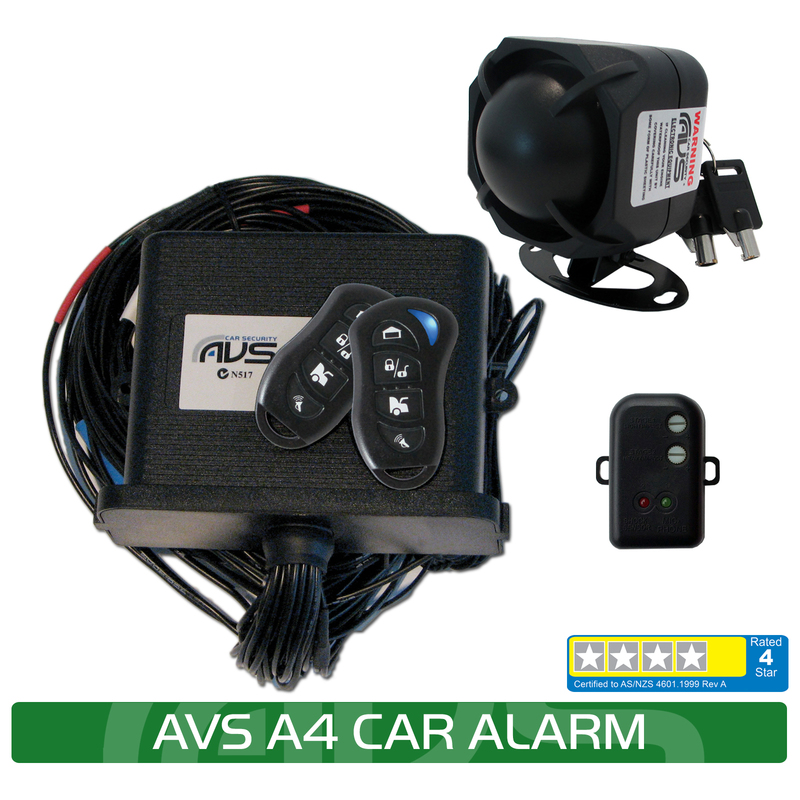 The AVS A4 is a great Four Star car alarm packed full of good features and all at an affordable price. Intrusion detection is provided by an intelligent glass break sensor that needs to also register an impact to trigger to the false triggers that standard glass break sensors can be prone to. And if you have a turbo car, like many kiwis do, then the AVS A4 includes seamless turbo timer integration. You can also use either the waterproof AVS remotes, or your car’s factory remote to operate the alarm. Use the popular waterproof AVS remotes to arm/disarm your alarm and lock/unlock the doors. Because remotes get the most wear and tear of any part of the alarm choosing a system with robust, reliable, and in this case waterproof remotes, makes a big difference to how well the system functions. Plus only with AVS do you get a 3-year warranty on your remotes. The alarm can lock/unlock the doors when the alarm is armed/disarmed for easy keyless entry. Or control the alarm with your car’s factory key. If you have a factory key with a lock/unlock button with most vehicles you can arm/disarm the AVS alarm at the same time. Boot release will also disarm the alarm and open the boot. This is a great feature giving all the functionality of a premium alarm system with ease of use. AVS turbo timer – the most secure option is to use the alarm’s in-built turbo timer. Choose a run time of 1, 2 or 4 minutes. The timer can also be shut down via the AVS remote. Turbo timer interface – link the alarm up with an external turbo timer allowing the alarm to be armed while the car runs on the timer. The AVS A4 alarm includes two immobiliser circuits. Starter motor and ignition system or fuel pump immobiliser cuts are made so the car cannot be started unless it is disarmed via the remote. The system will immobilise 40 seconds after the ignition is turned off or when the alarm is armed. The glass break sensor helps protect the cabin of the car be detecting the sound frequency of breaking glass. It will only trigger the alarm if the shock sensor also picks up an impact. This reduces false alarms. A good standard alarm installation will include protection for the doors, bonnet or boot. If any of these are opened while the alarm is armed the alarm will trigger. If you choose a budget installation please check with your installer that these important features are included (the bonnet is an important inclusion because many thieves will initially pop the bonnet to see if the alarm triggers and / or to cut the siren wires). This self powered siren communicates independently with the alarm so it cannot be fooled into turning off like normal battery back-up sirens. The siren will sound for 30 seconds if any of above intrusions are detected. Courier function – this feature allows the engine to continue running indefinitely while the system is armed. If the car alarm is triggered during this time the car will shut down and the alarm will sound. Be the first to review “AVS A4 Car Alarm 4 Stars Fitted” Click here to cancel reply. © 2019 Teletronics. All Rights Reserved.